Manohar Madhav Deshmukh from Shorapur, BVSC Graduate. 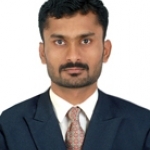 Manohar Madhav Deshmukh is Vererinary Pathologist and currently have no work experience. POULTRY DISEASE DIAG.. HISTOPATHOLOGY MOCROBIOLOGICAL TECH.. MOLECULAR TECHNIQUES..
are one of expert skill area's of Manohar Madhav Deshmukh . Manohar Madhav Deshmukh is working in Bio Technology industry.